In marketing, an innovative, forward-thinking spirit is crucial to staying ahead of the game. As marketing becomes increasingly digitized, it's important for businesses to remain competitive by finding new, creative ways to acquire and retain customers by leveraging social media, social data, and unique web and mobile experiences. In addition, E-marketing is holding important role nowadays when it come to boost our business. Its also help you to reach your potential 24 hours a day. It is much more cost effective comparing promoting your ads in a tradition ways by hiring promoter or giving out brosure. 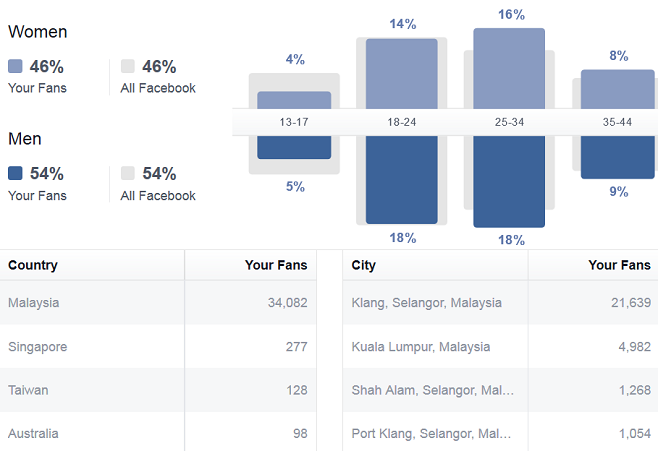 More than 90% of our website members / visitors are from Klang. We believe our advertising platform are able to boost your ads better exposure if your target audience is in Klang. Below is our website analytics report. To gain maximum exposure for our website, we do create our official facebook fans page which will update some of the important announcement from time to time. Below is our facebook statistic which grab from facebook insight graph. Our ads campaign will be running only after payment received. We package does not include banner design, also advertiser required to provide the content. After campaign expired, news or photo album will remain but will not be featured anymore. Package features and pricing are subject to change without prior notice. PaSangLang.com is undoubtedly one of the best advertising platform to reach Klang audience. Contact us for a comprehensive & cost effective proposal to boost up your business and exposure in Klang! We have launched our DEALS program at http://deals.pasanglang.com. This is basically a Website where merchants can put up their business offers, discounts & promotions, and customers can then download these deals as COUPONS from our Website, which they can either print out or flash on their mobile devices in order to enjoy the deal from the participating merchant. All you need to do is offer something special EXCLUSIVELY to PaSangLang.com fans ONLY, and in return we will feature your offer for FREE*! Exclusive here means customer cannot get the offer anywhere else, except from our Website. Must be for minimum 2 weeks. Notice : We need review your offer first before approving it, need to make sure it is attractive enough for fellow PaSangLangs. If you have any questions, please do not hesitate to contact us, we shall respond to your inquiry as soon as we can.